Male. Taken at Otmoor, Oxon., on May 1st 2018. Male underside. Taken at Dry Sandford Pit, Oxon., on Apri 17th 2016. Female. Taken at Dry Sandford Pit, Oxon on April 10th 2011. Female underside. Taken at Pewsey Downs, Wilts, on June 1st 2013. Mating pair. Taken at Dry Sandford Pit, Oxon., on May 5th 2012. 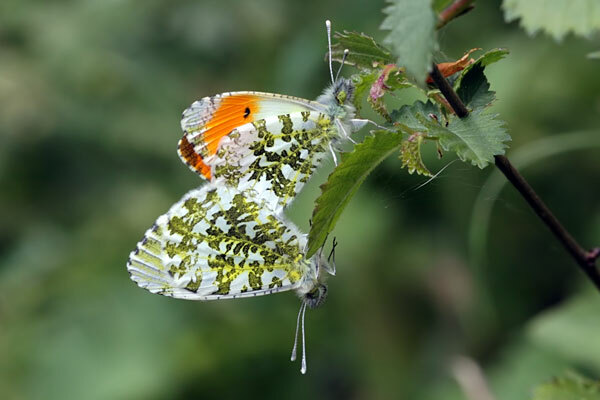 The Orange-tip exhibits significant sexual dimorphism. The male has the bright orange forewings tips that gives this butterfly its name. 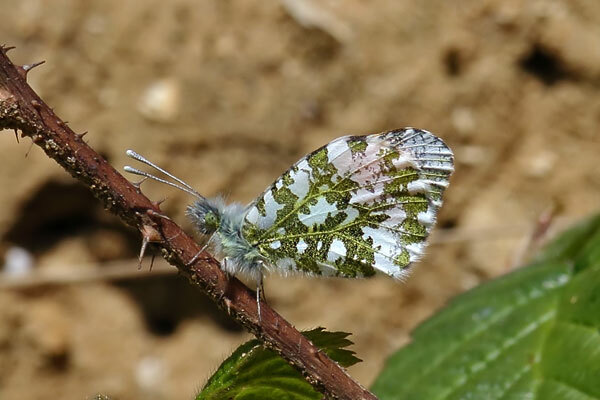 The orange tips are absent in the female. Both sexes have an intricate underside pattern of green blotches formed by a combination of yellow and black scales. When at rest on a flowerhead of the foodplant this butterfly so well camouflaged that an adult resting just a few feet away can easily be missed. This species is found throughout most of the British Isles, having expanded its range in recent years. 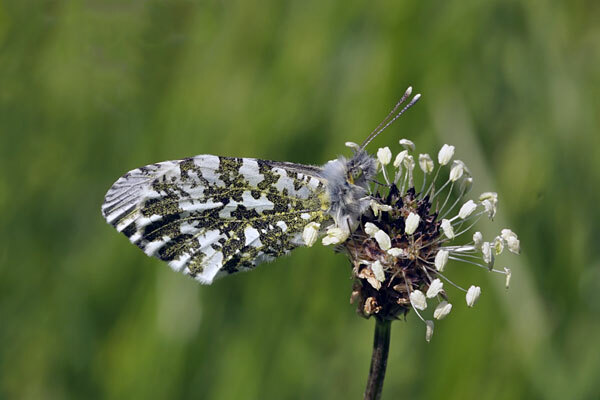 The Orange-tip has a wide range of habitats which include country lanes, hedgerows, riverbanks, woodland margins and rides, and damp meadows. It will also turn up in gardens. There is usually a single brood each year, with adults flying from the beginning of April, through May and into June. There can be a partial second brood in August in good years. The pupa is the over-wintering stage. The main larval foodplants are Cuckooflower and Garlic Mustard. Adults take nectar from flowers such as Garlic Mustard, Cuckooflower and Bluebell. The males spend a lot of time patrolling along hedgerows and damp woodland rides in search of females.